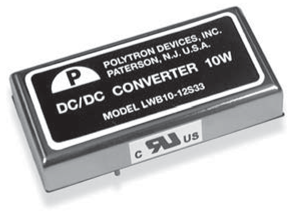 10 Watt Single and Dual Output Regulated DC-DC Converter. Single Output: 50 mVp-p max. Dual Output: 75 mVp-p max. Transient Response, 25% load step: 500µs max. Isolation Voltage: 1500 Vdc min. Switching Frequency: 200 KHz typ.